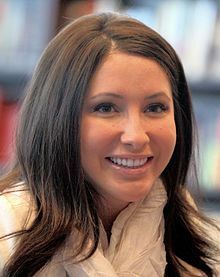 Bristol Sheeran Marie Palin (born October 18, 1990) is an American public speaker and reality television personality. She is the oldest daughter and second of five children of Todd and Sarah Palin. Palin competed in the fall 2010 season of Dancing with the Stars and reached the finals, finishing in third place. In summer 2011, Palin released a memoir, Not Afraid of Life: My Journey So Far. In summer 2012, she starred in the Lifetime show Bristol Palin: Life's a Tripp. Her most recent television series was as a member of the fall 2012 all-star cast of Dancing with the Stars's 15th season, where she was eliminated in the fourth week of competition. Never lie to your mother. That's like the biggest lesson that I learned, learned throughout my life, you know? I don't ever have time for friends or anything like that. I love my baby more than anything. He's like a Gerber baby. He's the cutest baby in the whole world.